(CNN) -- Underdogs Great Britain and Ireland completed a third straight 16.5-11.5 victory over Continental Europe on the fourth and final day of the biennial Vivendi Trophy, outside Paris, on Sunday. 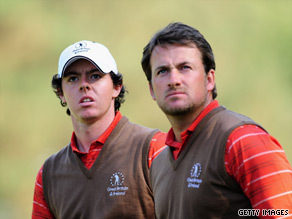 Rory McIlroy and Graeme McDowell won their singles as Britain and Ireland retained the Vivendi Trophy. Leading 12.5-5.5 overnight, Paul McGinley's side earned the point they needed to retain the trophy for a fifth time when Sweden's Robert Karlsson missed a six-foot par putt on the 16th hole to hand Northern Irishman Graeme McDowell a 3&2 win. McDowell and fellow-Ulsterman Rory McIlroy had led the way for the defending champions, securing victories in the fourballs, greensomes and foursomes as the opening pairing, and McIlroy took his team to within half-a-point of victory by defeating Sweden's Henrik Stenson one-up in the day's first match. Debutant Chris Wood, one of eight Englishmen in McGinley's 10-man line-up, rounded off a superb tournament by hitting back from two-down to salvage a half against Sweden's Peter Hanson in the last match on the course. Thomas Bjorn's European selection had been firmly second-best on the tournament's first three days but they saved face by winning five of the remaining seven singles matches. A 10-birdie blitz saw Denmark's Anders Hansen thrash Nick Dougherty 7&6, fellow-Dane Soren Hansen beat Steve Webster 4&2 and Vivendi Trophy veteran Miguel Angel Jimenez of Spain secured a 3&2 win against Ross Fisher. Oliver Wilson was beaten 5&4 by Italy's Francesco Molinari, while Anthony Wall's tie with big-hitting Spaniard Alvaro Quiros was declared a half after Wall had to withdraw with a shoulder problem. Simon Dyson lost 3&1 to Denmark's Soren Kjeldsen, but Robert Rock defeated Spain's Gonzalo Fernandez-Castano one-up after a birdie on the 17th hole. Formerly known as the Seve Trophy, the competition was created by Spanish legend Seve Ballesteros to give European players an opportunity to hone their match-play skills in preparation for the Ryder Cup. Ballesteros has recently completed a course of radiotherapy after undergoing surgery to remove a brain tumor and was subsequently unable to attend, but he issued a message praising both sides. "I take this opportunity to congratulate Paul McGinley and his whole team for the victory in this year's Seve Trophy," he said in a video message. "This week the GB&I team has managed to keep the trophy, but we (Continental Europe) have two years to prepare ourselves for the 2011 Seve Trophy."